Digital advertising is the most targetable, measurable, cost-efficient, and quick-to-implement way to do this. Magna Global forecasts that digital media will account for 50% — $291 billion — of all ad spend by 2020. The only problem is that consumers are already inundated with hundreds of digital messages every day. So, what’s the secret for standing out? Using customer data to inform your advertising strategy. Did you know your CRM (Customer Relationship Manager) can help you take first-party data — like contact information, buying habits, and content interaction — from existing high-value customers to create profiles and find new customers just like them? These profiles are called “lookalike” audiences: new groups of people that match the characteristics and behaviours of your existing customers (without any overlap). Google Display Network, Search Network and Google-owned services YouTube and Gmail, as well as Facebook, Instagram and Twitter, all allow you to create lookalike audiences on their platforms. These platforms overlay your customer information with their own user data to identify new audiences that are most like your target customers. 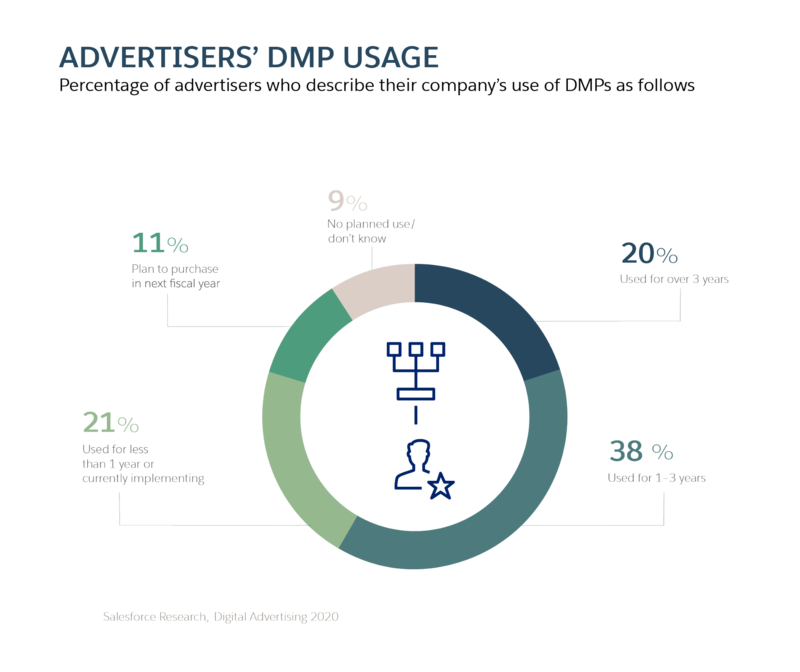 If you’re among the 91% of advertisers using or planning to use a DMP (Data Management Platform), you can maximise your audience targeting capabilities even further. Integrating your DMP and CRM unlocks a wealth of data to create even richer lookalike audience profiles. You can use these lookalikes on open display ad networks, leveraging your DMP to serve the right ads to the right people at the right time. A whopping 71% of consumers prefer personalised ads. In fact, they’re almost twice as likely to click on an ad from an unfamiliar brand if the creative is tailored to their preferences. Today’s audiences practically demand personalised, 1:1 brand experiences to earn their attention, let alone their business. The good news: you can use customer data to tailor your messaging and campaign creative to almost any audience segment based on interests, geolocation, customer journey stage, and more. This personalised creative can also help improve engagement with existing customers. ConAgra Foods, Inc. successfully used customer data to boost engagement around the Hunt’s tomato brand. Using behavioural data, ConAgra was able to target environmentally-conscious consumers t with relevant content about Hunt’s organic products and the company’s unique steam process for peeling tomatoes. This campaign resulted in a 300% increase in consumers who said they would use Hunt’s tomato products and a nearly 200% lift in awareness about the brand’s steam peeling process. Failing to coordinate ad campaigns with other marketing, sales, and customer service efforts is the fastest way to waste ad dollars. Integrating your advertising and marketing strategies across channels ensures that campaigns work together to reach more customers and hit KPIs faster. For example, aligning a Facebook ad campaign and an email campaign with similar messaging can reinforce a single call-to-action to help drive more conversions. Aligning with sales and customer service can also take your advertising strategy to the next level. For example, someone with an open customer service ticket is not likely to respond to an ad promoting a brand they are currently frustrated with — nor is someone who has already purchased the advertised product. You’d be wasting budget, and perhaps annoying your audience, by serving them these irrelevant ads. AI-powered tools like Salesforce Einstein give you the ability to refine your audience targeting parameters to ensure that only the most relevant ads get served to the most relevant customer segments on the channels they use most. This results in more cost-efficient campaigns and more satisfied customers, overall. Amplify Credit Union saw first-hand success with these three digital advertising strategies. A financial cooperative with 57,000 members and eight locations throughout Texas, Amplify implemented Salesforce Marketing Cloud to elevate its marketing efforts and increase ROI. The company used Marketing Cloud to integrate all of its channels. Using CRM data and Advertising Studio to refine ad targeting, Amplify increased lead generation by 50% — without having to change ad spend. Amplify also combined lookalike audience functionality with Journey Builder’s customer experience mapping to increase email open rates by 45% and ad click-through rates by 20%. This helped increase Amplify’s annual net profit to over $1.4 million, resulting in a 400% increase in revenue for Amplify’s outbound sales team. Email us at asklava@lavaprotocols.com or call us at 03-7885 9720 if you’d like to know how you can implement/ integrate Salesforce into your business.